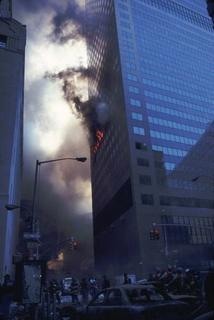 WTC7 only had small, limited fires. 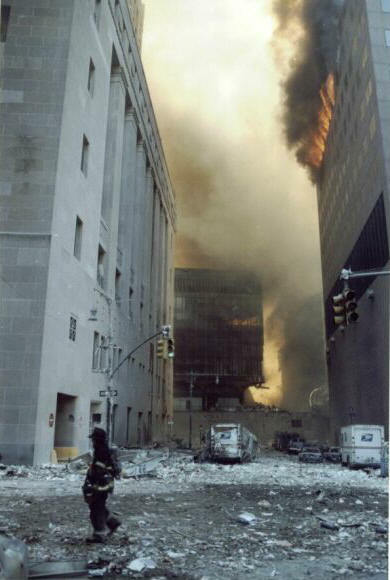 This is one commonly-shown picture of the WTC7 fires. As you can see, there’s not much smoke and only a little flame: nothing very impressive. Find a closer, though, and you can see a glow suggestive of fires on more than just that one floor (click the image for a larger version). And other images seem to show that fire getting worse. 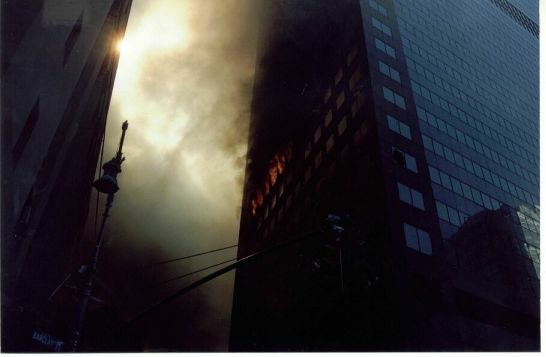 Check the FEMA report and you’ll find a picture of the other side of the building, which seems to show substantial amounts of smoke (you can confirm we’ve done nothing more than grab it from a PDF file by viewing the original from the FEMA site -- download Chapter 5 at http://www.fema.gov/rebuild/mat/wtcstudy.shtm). 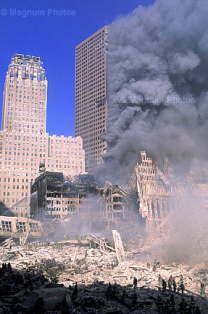 It’s surprising how many people have told us this shot is a fake, not WTC7, “photoshopped” and so on. Of course they don’t explain how other images show a similar effect. This is plainly a threat to the “limited fires” idea, as recognised here. 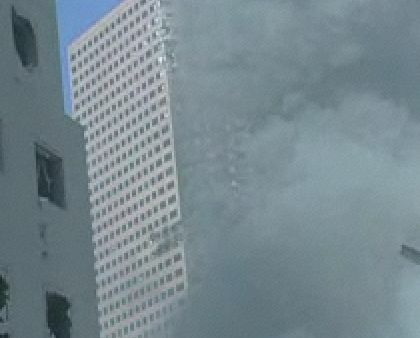 Firstly, we are told that there were fires on the floors 7, 8, 10, 11, 12, 19, 27 and 28, but the photo seems to have smoke pouring out of the windows on almost every floor. Secondly, the corner offices (except for the 27th and 28th floors) show no indication of fire on the west face of the building, but these very same corner offices appear to belch smoke from their south face windows. 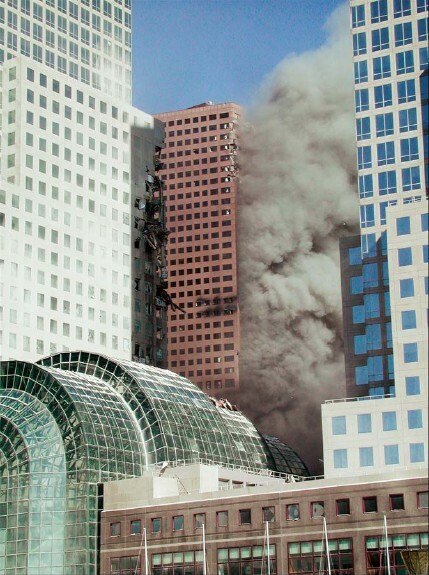 Thirdly, the north side of WTC 7 has few (if any) visible signs of fire at this time (for example, see Figure 5-20 below) so it seems quite impossible that the south side should be ablaze to the extent that the above photo would indicate. So what does the writer do with this information? Change his mind and accept that maybe there were larger fires in WTC7, after all? 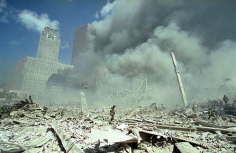 All, in all, I think it quite clear that either this photo has been faked, or it is actually a picture of the dust cloud from the collapse of WTC 1. I think the second option is more probable, as it fits all the facts and allows the "oh, it looks like we made a mistake, so sorry" excuse. 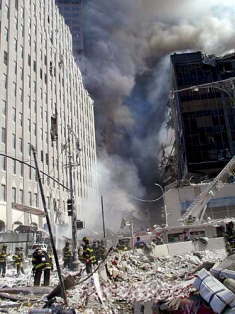 The dust cloud has been given its peculiar shape by the breeze channeling through the gap between the Verizon building and WTC 7. 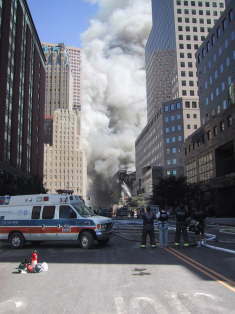 Many others have told us that this is dust from the collapse, so let’s see if that makes sense. First, here’s the direction we’re looking in, as recorded in Chapter 5 of the FEMA report (link as above). 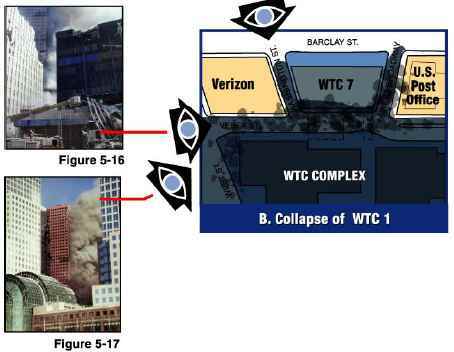 And now let’s see the WTC complex as a whole. 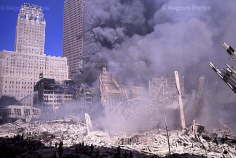 How is dust from the collapse of WTC1, appearing to be smoke flowing from WTC7, and towards the post office or WTC5? 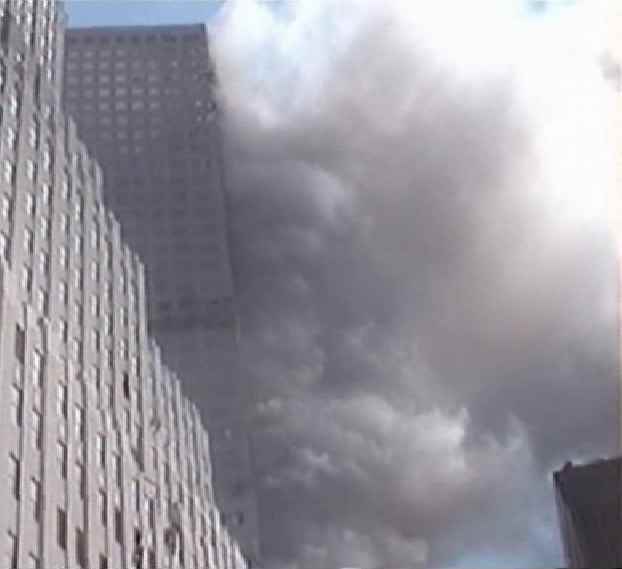 The simple answer is it isn’t, and in fact a video taken from another angle shows that this really is smoke coming from WTC7. Download it here (5MB). Need confirmation? 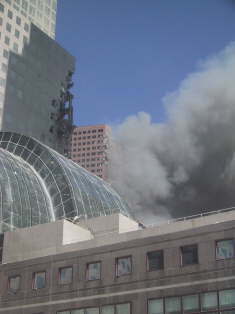 The last clip shows the smoky side of the building more clearly. Some of the windows seem brighter than we’d expect from reflection alone: could it be that this is because of flames inside the building? (Note: we’re just guessing, so do NOT judge than from the still, which we’ve blown up and then cropped: grab the original footage instead -- it’s under 700KB -- and decide for yourself).